One Shell Square is the tallest building in New Orleans and in the state of Louisiana. New Orleans has over 100 high-rise buildings. 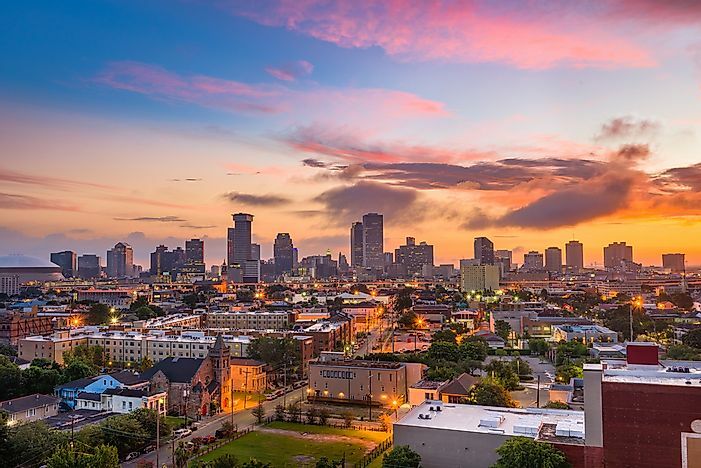 The skyline of New Orleans, Louisiana has over 106 beautiful high-rises with the tallest reaching a height of 697 ft. About thirty-six buildings in the city are over 250 ft tall. The first high-rise was constructed in 1969 followed by the tallest building in the New Orleans in 1972. The oil boom which started during the late 1970s to the early 1980s saw the construction of seventeen buildings in New Orleans. One-shell square is a 697 ft high-rise which is along the 701 Poydras Street in the CBD (central business district). It is a 51-story structure which was designed by Skidmore-Owings and Merrill. It is the tallest tower in the state of Louisiana and it is taller than Driskill Mountain. It was the first skyscraper in the south to rise above 656 ft, and it held the title of the tallest structure in the southeast until 1976 when Westin Peachtree Plaza was built. The building was built using a double-tube system, and it was opened in 1972. Formerly known as the First NBC Center and Bank One Center, Place St. Charles is a 53-story skyscraper which is at St Charles Avenue in the CBD. Mathes Briere Architects designed the 645 ft structure. It was built in the post-modern style, and it is the second tallest structure in Louisiana. It was constructed on the site of St. Charles hotel. Currently, St. Charles lace LLC owns the building, and it was opened in 1984. The first and second levels serve as rental spaces and the third to the thirteenth floors are parking spaces. It has more floors than any other building in the city. Plaza Tower is a 45-story structure located in New Orleans. Leonard R Spangenberg, Jr, and Associates designed Plaza tower, and it is the third largest in Louisiana. The building has been vacant since 2002 due to various environmental issues like asbestos and toxic mold. Giannasca development group purchased the structure in 2005, and they had planned to convert it into a 197-unit condominium tower. However, after the damages caused by hurricane Katrina, they were involved in misappropriation of the insurance cash, and this resulted in the group members suing each other and defaulting on the mortgage. The construction of Plaza Tower was completed in 1968, and it became the tallest tower in the city until 1972 when One Shell Square surpassed it. Energy Centre is a 39-story structure which was designed by HKS, Inc. The 530 ft skyscraper is the fourth tallest structure in Louisiana and New Orleans. Energy Centre experienced some minor damages in August 2005 during the Hurricane Katrina. The hurricane destroyed some false windows which were used to cover the climate control system. The building is at 1100 Poydras Street, and it is bounded by four streets including Loyola Avenue, Lafayette and South Rampart streets. Sheraton is a 49-story skyscraper which is along 500 Canal Street in New Orleans. The 490 ft structure is within the city’s CBD, and it is the fifth tallest building in New Orleans. The building was constructed in 1982, and it is the tallest structure in the city which is used exclusively as a hotel (Sheraton Hotels and Resorts). Previously known as Poydras Tower or First Bank Tower, the first bank and trust tower is a 36-story high-rise which was designed in the post-modern style. Joseph Canizaro developed the structure. Welton Becket and Associates designed the structure. The 481 ft tall building is the sixth tallest building in the city and is owned by Hertz investment group. Bronze tinted glasses and granites clad the exterior part of the structure. It is illuminated by some spotlights at night thus making it the most visible skyscraper in the city’s night skyline. While the city is recovering from the damages caused by hurricane Katrina, there are many projects which have been proposed, but the high cost of labor and materials have eliminated quite a number of them. The tallest approved plan was Trump international hotels and towers which would have been the tallest in the city, but its construction was canceled. Although no new buildings are coming up, many of the older structures are being renovated and changed to hotels, apartments, and condominium. This page was last updated on April 20, 2018.